One of the really cool things about living on the Prairies is that the ground contains an extraordinary depth of sedimentary layers. So hiking in a river valley, like the one in Edmonton, can give you a view of over 60 million years of history. Pretty sublime! A fun thing to do is look for specific layers from big events in history. 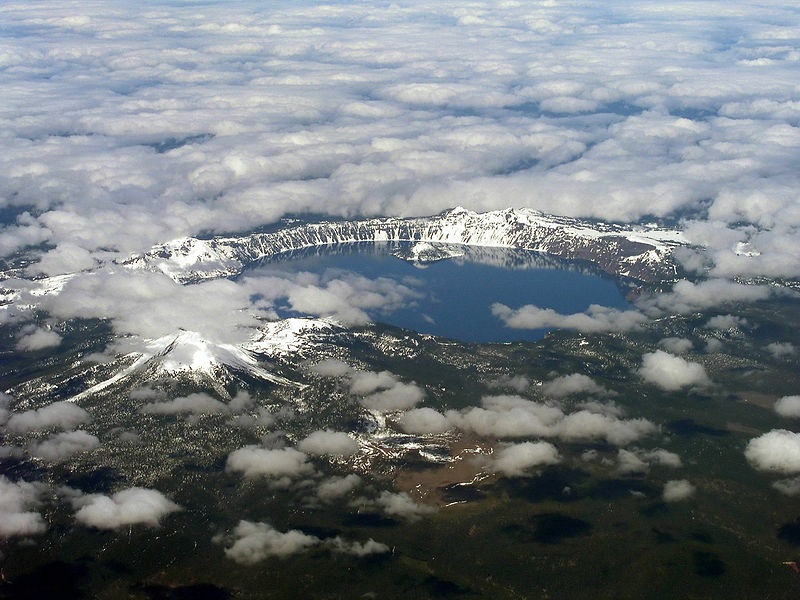 One of those big events happened in Oregon about 7600 years ago with an enormous volcanic eruption at Mount Mazama in present-day Oregon. The volcano spewed out so much (an estimated 50 cubic kilometers of magma!) that the ash can be found as far north as Edmonton in Canada. Ash distribution across Western Canada and the U.S. from Mount Mazama. Figure taken from R. Mussieux and M. Nelson, 1998: A Traveler’s Guide to the Geological Wonders of Alberta, Provincial Museum of Alberta. A fairly easy place to spot this feature is on the south bank of the river, just west of the LRT bridge. There are easy paths to get there, with no climbing involved, so finding this can be a fun hike for pretty much anyone. Photos from the Edmonton River Valley. On the left, the red arrow marks the ash layer. The right is a closer view. 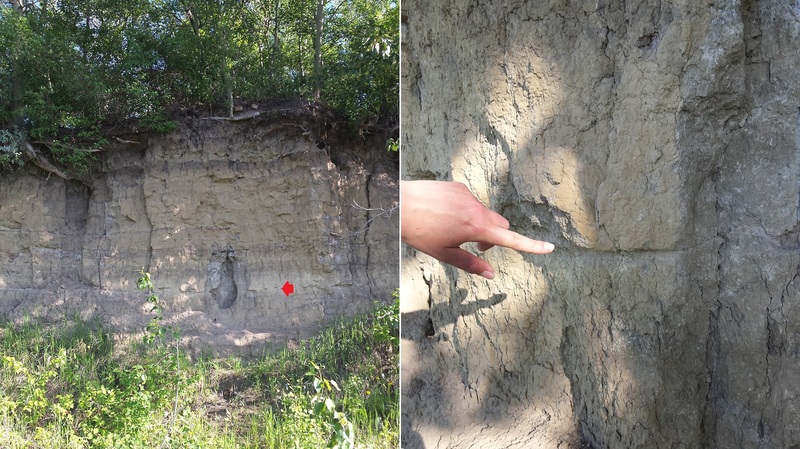 As seen in the above pictures, the ash layer can be spotted as a lighter colour grey than the over and underlying sediments. It also tends to be inset from the rest of a sheer wall, as though someone has dug out a shallow finger-wide channel all the way across. This is because the ash holds together and erodes differently than the other sediments. The difference is texture can be felt by pinching a little bit of the different layers between one’s fingers. Because this ash layer can be found across such a wide area of western North America, it is a useful marker for Geologists. Volcanic ash layers are often useful date markers, because unlike many other types of sedimentary layers, an ash layer is composed of rock that was formed at the same time as the layer was set down. Unfortunately, ash from Mount Mazama is too recent to directly apply a lot of radiometric dating tools. Instead, geologists have had to carbon-14 date things like wood in, under, and over the ash to figure out how old it is. Using this method, they’ve measured it to be between 7682-7584 years old . Alberta. Edmonton (AB): Provincial Museum of Alberta. Daleiden Dodges First Charge, But Is He Innocent?